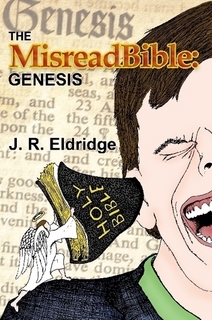 J. R. Eldridge is a British satirical fiction author with a fascination for religion and the absurd mythology that surrounds it. He especially enjoys poking fun at it. He began writing joke Bible verses on Twitter, and eventually moved on to writing parodies of Bible stories. He collected some of these in his book The MisreadBible: Genesis. The Bible is an ancient book of fairy tales which, for some strange reason, millions around the world take seriously. We all know at least some of the stories, having been raised in a culture that’s practically dripping in biblical horseshit, and a lot of us were even subjected to Sunday school classes and church sermons where we were read ‘pearls of wisdom’ from this tired old tome. I’ve taken it upon myself to create a version of the Bible for the non-believer. Out with the literal interpretations and convenient allegories, and in with the scepticism, fun-poking, and a fuckload of swearing. If you want to know how much of the absurdity comes from my warped imagination, and how much comes from the inerrant word of God, I invite you to look up the verses for yourself on a Bible website. A lot of the verses are absurd without being ‘misread’.